I Ate Tiong Bahru, Stephen Black’s popular book about Tiong Bahru, has a sequel that’s nearly finished. It’s called To Eat Tiong Bahru. And it needs a cover. A striking cover will allow a second fundraising campaign (for actual publishing) to begin. For now, though, the goal is to commission an artist to create an artwork. That artwork will become the cover as well as the basis for a limited edition print. To Eat Tiong Bahru features more original research, more interviews, more creative writing and more life experiences; it will be another “must read” for anyone who enjoys great writing about the food and culture of Tiong Bahru, Singapore and Southeast Asia. “... the anecdotal tales you have recorded jump back at me through time. It is a rare occasion when I get the opportunity to meet someone who is so dedicated to writing up the heritage of the area with stories from the street. To Eat Tiong Bahru, and the cover you help make, will continue the excitement of I Ate Tiong Bahru. What will the cover be like? Colorful! Descriptive! Charming! Thoughtful! Contemporary! Scenes to be featured include The Tiong Bahru Market, Yong Siak Street, a typical coffee shop, architectural highlights, “Tony’s”, the Monkey God Festival and The Hungry Ghost Festival and morel. Kite flying on the roofs, a bit of the Bukit Merah Fires and other historical scenes too. To create the cover artwork, three steps are necessary: creating and finding photographs, layout tests and actual creation. The cost for the artist/illustrator cannot be exactly determined at this time. Frankly, the budget means that either a fantastic artist/illustrator will work at a special rate or we can find a promising young artist/illustrator who would like exposure and a great portfolio piece. Either way, photographing, researching and testing are necessary. Once the artwork is made the poster will be created. The feel of the cover will be light-hearted and contemporary, with a little surprise. We start an Avvio campaign for publishing! And, the poster will go on sale, with a portion of the profits going to the Tiong Bahru Benevolent Association. For more than thirty years, this all volunteer group has been feeding and helping the elderly and low income families in Tiong Bahru. An artist/writer/photographer/producer, Stephen Black has been based in Asia since 1984 and has lived in Singapore since 2002. His artworks and images have been shown, published and collected around the world and he has worked with Annie Liebovitz, Kazuo Ono, Michelin three-star chefs, CNN, Cartoon Network, Fox, Fuji TV and France 2. His other books include Obama Search Words, Furikake, Bali Wave Ghost and Contact With Shadow. A fictional biography that he co-wrote featured prominently in Michael Lee’s Office Orchitect installation which premiered at the 2011 Singapore Biennale and has since been shown regionally. The co-founder of 3how, a music/theatre performance ensemble, Stephen co-produced 3how: The Riverwalk Session, a spontaneous recording session by Amith Narayan, Curtis King, Bani Haykal and award-winning vocalist Wilson Goh. Online until February 2015 is SPOKEN, a co-production with Eugene Soh, that is a phenomenon of art, creative writing, social media and virtual reality. Online at gallery.sg until February 2015 is SPOKEN, a project Stephen co-produced with Eugene Soh. A phenomenon of art, creative writing, social media and virtual reality, SPOKEN features contributions from Yasumasa Morimura, Stelarc, Sjon, Nhung Walsh, JUMPTHECUT, Lagos 2060, Buke and Gase, Vincent Leow, Irving Paul Pereira, Xu Xi and other dynamic creatives. Like its predecessor, To Eat Tiong Bahru will skillfully merge anecdotes, historical research and loving explorations of food. The book will be a rojak of snapshots of daily life, snippets of information, essays, written portraits, short stories and food tips. For example, the story of Singapore’s first rock and roll band, Ronnie and the Burns, will be revealed for the first time. The long vanished Chinese School is brought to life through interviews and research. Also included is Donald Wyatt’s breathtaking story on how his family outran the Japanese across Malaya to become one of the first families to live in Tiong Bahru. These and other factual essays contrast with lyrical short stories that include one about a Danish woman who fancies herself to be the Diane Arbus of Tiong Bahru, circa 1974. Other short stories feature a narcissist, the Monkey God, a very wealthy Indonesian and cats. Over four years of research, interviews and life experiences have gone into these books about Tiong Bahru. All this work was self-funded. Although the first book has been well-received, the reality of the situation is that, without your help, To Eat Tiong Bahru cannot be published. Your support of the cover/art edition is a beautiful way to support a notable independent project about Singapore, while adding to your art collection at the same time. The first book cover symbolized the white architecture of the Estate. It was anonymous, with no information except the title. 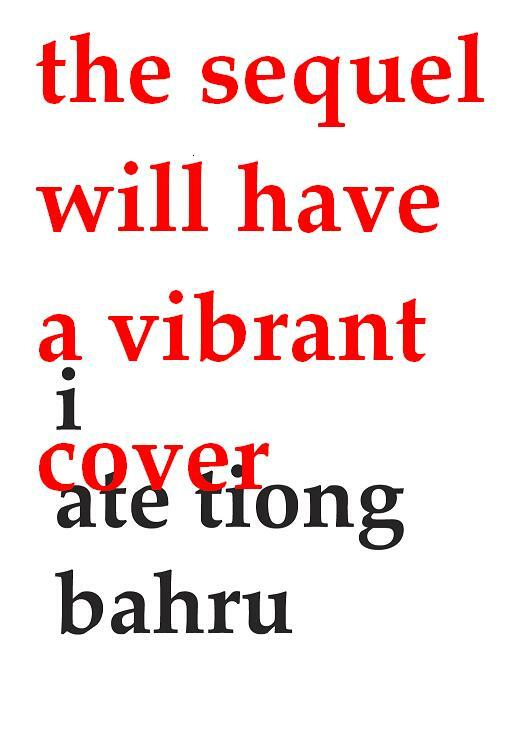 The cover was meant to be an intriguing challenge.The cover of To Eat Tiong Bahru, however, will be dynamic! Festive scenes, depictions of everyday life and private moments will make the cover artwork eye catching and informative. $5 An original photographic postcard mailed from Tiong Bahru and signed by Stephen Black and a whole lot of thanks! $35 A signed copy of the poster plus the postcard from Stephen Black. $80 A customized Tiong Bahru tour of at least two hours, for one to five people. This entry was posted in Art, Book Merah, Singapore, Stephen Black. Bookmark the permalink.